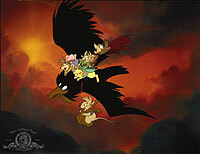 The Secret of NIMH (1982) - Sci-fi-central.com.  USA  1982  82m   Directed by: Don Bluth.  Starring: Derek Jacobi, Elizabeth Hartman, Arthur Malet, Dom DeLuise, Hermione Baddeley, Shannen Doherty, Wil Wheaton, Jodi Hicks, Ian Fried, John Carradine, Peter Strauss, Paul Shenar, Tom Hatten.  Music by: Jerry Goldsmith. Don Bluth has always had his unique animation, in fact if you watch any of his past work at Disney then you can definitely tell when he had a hand in it. Perhaps that's what I love most about Mr. Bluth's films; he has his own unique style, his own way of drawing that is different from other animators. He's an individual, and I'm sure when he walked out of Disney, they weren't aware they had just lost one of their best animators. 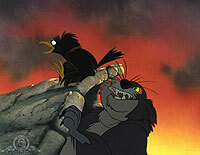 Which brings me to The Secret Of Nimh. This animation gem was directed by Mr. Bluth and was released in 1982. It got pretty healthy numbers at the box-office, but as mentioned in my review for the film's sequel; it was bested by E.T: The Extra Terrestrial. I think what might have had actually scared audiences off was the darkness of this movie. 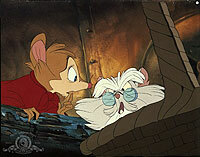 At that time, audiences were likely use to kid-friendly films such as The Rescuers or the film that had been released only a year before NIMH, "The Fox and The Hound." 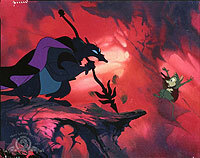 (actually, that had some dark stuff but nowhere near as dark as NIMH)So, when something as dark and actually violent as NIMH was released, it probably didn't sit well with those use to the candy-canes and lollipops that Disney was offering. 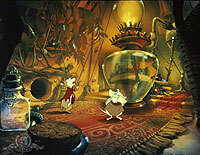 The film itself is based off the Newbery winning children's book, "Mrs. Frisby and the Rats of NIMH" by Robert C. O'Brien. 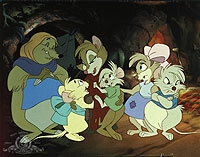 The story is quite simple, about a widowed mouse named Mrs. Brisby (her name had to be changed due to a license law or something or other) who is raising her four children Martin, Theresa, Timmy, and Cynthia after the death of her husband, Jonathan. When Timmy is stricken with pneumonia, it becomes impossible to move him from the house because of the chilly air. Of course, the humans don't know of the Brisby family's woes when they decide to start up their plow and begin planting new crops. Desperate to protect Timmy and her other children from death, Mrs. Brisby seeks the help of some mysterious rats that reside in a rose bush. It turns out they may be helpful, because they are no ordinary rats. They have actually escaped from a mental hospital after being injected with an drug that makes them super-geniuses and slow to age. 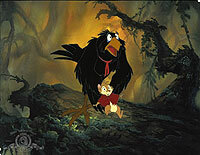 Along the way, Mrs. Brisby meets a wisecracking crow named Jeremy (voiced by Bluth veteran, Dom Deluise); and actually learns the sad truth behind her late husband's death. What I love most about the film, aside from its level of maturity (which I will dwell on later), is the fact that Bluth took characters that were so minor from the novel and gave them more. The first (and most obvious for those who read the book) is the villain, Jenner. In the novel, Jenner was nothing more than a rat that wanted to stay at the rosebush instead of venturing away where there could be safety from NIMH. In fact, he dies pretty early on in the novel and you don't even meet him, you just read that he left the rosebush with a small group of the rats and was killed along the way. In the movie, however, Jenner is the villain. Yes, he still wants to stay in the rosebush, but the lengths that he is willing to go to is extreme to make sure that it happens. His lackey Sullivan (also a minor character in the novel) is actually not your typical villain sidekick. He is actually more of anti-hero and actually becomes one of the heroes at the end. There are more characters who have their roles expanded like The Shrew (Auntie Shrew in the film), Brutus (who is downright frightening in the film), Jeremy, and even Mrs. Brisby's kids. I just love how the choice was made to take such minor characters and actually expand them. What I also love about the movie is the animation. If anybody has read my review for the sequel, you will know that I DID NOT LIKE THE ANIMATION!This is a very different story, however. Bluth still maintains his unique style while being able to cut the apron strings that Disney had tied around him. I mean, there is blood in this movie which is something you rarely see in a Disney film. I mean, Sleeping Beauty gets her finger pricked and there's not even a drop. Here, we get blood in two scenes. I also love the colors used for the film, because they reflect the film's atmosphere. Dark, but still enough to stay true to the vivid colors of the happier animated features. Now about the darkness. I don't mean dark like it's only meant for an extremely depressed audience. I mean dark in the sense that it's not a fairy-tale, and is actually pretty grounded in reality. Which is actually something that you rarely see in the genre of animation. Much like the films of director Martin Rosen, Bluth seems to treat animation as a genre and not something that is just meant to entertain kids. He is not afraid to have violence, swearing, and a fleshed out story. He pays attention to his art, and uses it to set the story's tone. That is all animation is: A genre and Bluth understands. I will not deny that there is a fantasy undertone, but it certainly doesn't add a sense of whimsy and it certainly isn't overblown. The film, like a favorite internet critic of mine pointed out, it takes the audience seriously. It doesn't try to melt your brain by putting in nonsensical music numbers, princesses, and bright colors. No, this film is geared towards the young and the old. What's the conclusion? 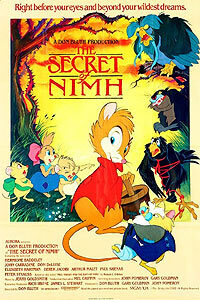 The Secret Of Nimh is awesome. It's animation is stunning, it has a great storyline, and great characters. P.S-Again, I apologize if any of these critiques appear to be strongly borrowed from other reviews. Review by CryptMistress from the Internet Movie Database.